The Men's Atacama Jacket is perfect for exploring the desert or foreign cities, Jack Wolfskin's UV protection travel jacket can also be converted into a gilet thanks to zip on and off arms, so you're ready for your next destination. 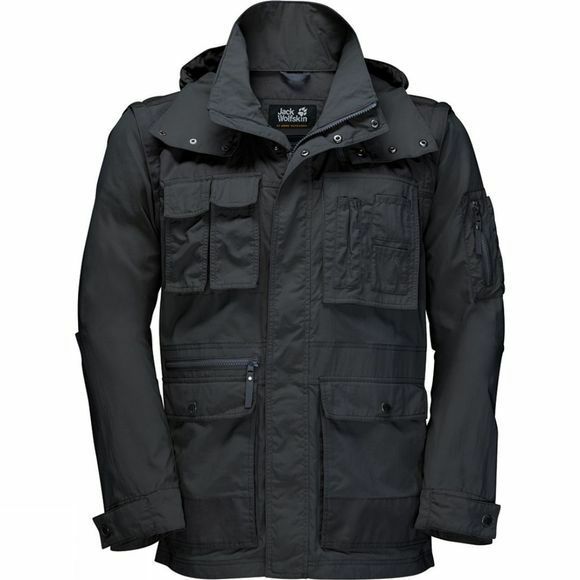 This field jacket comes with an incredible amount of stow space, a practical feature when travelling. With nine pockets in total, you can carry much more than just your smartphone, sunglasses and travel guide. Supplex has become a classic fabric for travel wear. This lightweight, breathable fabric offers outstanding sun protection and is very packable, so the jacket takes up very little space in your bag. The shoulders are reinforced in Function 65 Wax, while the high collar stow inside it protect your neck and head from the sun or light showers.